Ever since the first people sat around their campfires, we have told stories. People tell tales to explain events and to justify their actions. We see how one thing led to another, and wonder what might happen next. We learn about how we should behave in a similar situation. We use stories to understand the world. Myths are some of the best stories ever told. They have stood the test of time, surviving to be re-told generation after generation. 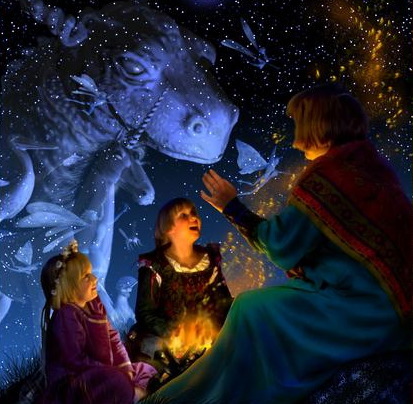 Tales of heroes and clever girls, treasure and monsters capture our imagination. Our modern world doesn’t contain many dragons, but metaphorical monsters still exist. Whether you’re fighting the establishment, coping with colleagues or dealing with depression, stories show you a way to go on. Myths and fairytales tell us to be brave and teach us to tackle life’s problems. Whether you’re a princess or an urchin, a lot of courage and a measure of good sense will see you through. Find out how stories can help you at work in this great New York Times article on ‘Storytelling your way to a better job‘. More about the power of stories in my new book ‘StoryWorks‘. Join the StoryWorks Mailing List for future updates! Visit my Author Page and follow me on Twitter @janebaileybain. If you like this post, use the buttons below to Share on Facebook, Twitter or Stumbleupon. This entry was posted in Life, LifeWorks, Mythology, StoryWorks and tagged better job, career, job, Myth, New York Times, stories, Story, storytelling, StoryWorks, work. Bookmark the permalink.